The Santa Clara High Technology Law Journal (HTLJ) is a scholarly publication of the Santa Clara University School of Law. HTLJ is a leading forum for multidisciplinary discourse on emerging issues at the intersection of technology, law, and public policy. Prior to Volume 30, the journal was known as the Computer and High Technology Law Journal. 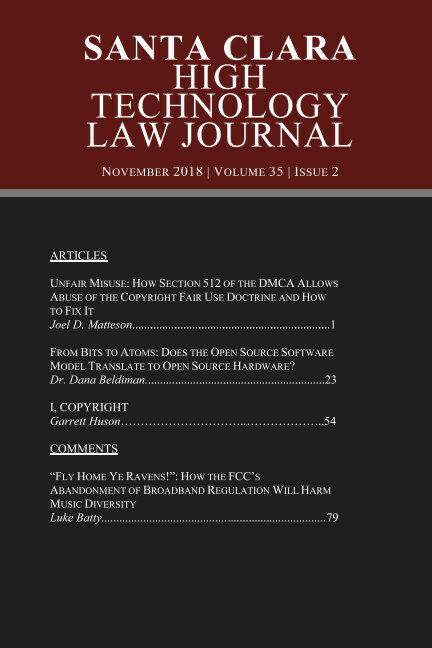 Originally founded in 1984 as the Computer and High Technology Law Journal, the Santa Clara High Technology Law Journal (HTLJ) focuses on all aspects of intellectual property and high tech law. Located in the heart of Silicon Valley, HTLJ continues to be at the forefront of novel legal issues, fostering debate and discussion in the home of leading tech companies like Google and Apple. HTLJ publishes four issues per volume. This is the second issue of Volume 35.